Language, Music and Place in Délįnę, Northwest Territories, Canada develops an interdisciplinary approach to language documentation. As the community of Delįnę makes a transition to self-government, there has been increased interest in stories, song, and concepts of place in order to better understand what these reveal about self-government, or, more particularly, what is at the core of being a Dene (person). Governance thus is one focal point of this research. Complementing this, the project involves the development of an indigenous research methodology with respect to language research. More particularly, the research explores variation, change and continuity in language, stories, song, and concepts of place as they relate to governance and land stewardship. The approach involves documentation with three groups of families from distinct traditional land use areas across generations, including archival and new materials, as well as dialogue with relatives from neighbouring communities with distinct dialects in order to understand the role of place of origin in variability. Nicole Beaudry is leading development of a book based on her research on Dene songs. Jane Modeste is prioritizing production of books based on transcribed oral texts. The Délı̨nę Song book is about the singing, drumming, and playing traditions of the Sahtúot'ine who nowadays live in Délı̨nę, a community on the shore of Sahtú (Great Bear Lake) in the Canadian Northwest Territories. There are many reasons such a book can be of interest, but the main objective here is to offer to the people of Délı̨nę one path into their historical past, the song path. The materials brought together here come mainly from a recording collection I made between 1988 and 1992 (also in 2012, 2014, and 2015) with many Elders who not only talked to me, but also sang a good number of songs. Thus this book-with-audio should reflect those Elders' talking and singing voices, and much of the knowledge and wisdom they wished to transmit to the future generations. Already in 1988, many of them told me that they thought these recordings were useful for exactly that purpose. They are still saying it today. The idea was to give back to Délı̨nę the benefits of a research project that started so long ago in a way that would be immediately useful. So, from the many hours of recording featuring 19 Délı̨nę Elders, some 125 audio excerpts were chosen to illustrate the different topics: ets'ulah, ı́lıwáh, edzi, náogeye, ǝghǝle, naowhenáreɂę, godı, and a few other things such as a discussion of Dene singing styles. Each topic presented will be accompanied by a specific Dene-English terminology. Approximately 100 audio excerpts were transcribed into Dene by Alina Takazo, including song texts when possible. Also translated into English, the texts are complemented with song notations (approx 150). Some drawings by Dennis Kenny as well as a number of photographs will also be included. WHY WRITE A BOOK ABOUT SONGS? Why not just hear the songs themselves on an audio document? Because I strongly believe that songs are a powerful vehicle for any people's traditions, although their meaning is not always obvious at first hearing, even for those of the same culture. Most Dene singers tell the story of their song, and explain how it is meaningful to them. It is so important that young people hear their elders' words about the songs and the traditional Dene lifestyle. That is why the book is called SONGS and STORIES from Délı̨nę. Together, these songs and stories open the door to Délı̨nę's historical past, to the profound human values inherent to Dene culture, to the relationships and behaviours of groups and individuals, to people's spiritual lives, to their sense of humour, and to their capacity for rejoicing. Yes, all of that can be learned through song. But more importantly even, the songs enhance the importance of learning to 'listen' (as opposed to simply hearing) - not only with one's ears, but also with one's heart and intelligence. Listening leads to learning, which means that one is in possession of necessary tools for a long and harmonious life. Sarah Kodakin-Masazumi and Alfred Masazumi. 2014-2018, from ECE, approximately $50,000. This project is part of the Wildlife, Habitat and Harvesting program funded by the Environmental Studies Research Fund. The objective of this work is to address a gap identified in early work on the Spatial State of Knowledge project: the accessibility of previously recorded harvester knowledge to the community and regional organizations mandated to manage resources in the Sahtú Settlement Region. This includes key place names, ecological knowledge, and land use projects and datasets which define the harvesting landscape. These projects, the existence of which may or may not be common knowledge among decision-making organizations, include documentation of harvester knowledge, knowledge of changes in habitat (both natural and due to earlier exploration and development activities in the study area), and other socio-ecologic topics. Often, the work has been topical, centering on place names, family biographies, characterizing caribou populations and biodiversity, and describing long term changes in ecology and harvesting practices. As traditionally named places in Dene languages are the framework upon which other types of spatially-oriented, ecological, and traditional use information are structured, this project will bring together little known and recently re-discovered place names datasets, along with more recent place names work. The names will be assessed through working with linguist(s), and verified with knowledgeable Elders and land-users. Gaps in existing names and required changes will be assessed through engagement. As place names are extremely important as a baseline ecological dataset, and were identified as a gap in early Spatial State of Knowledge work, this project will address this gap and directly increase the available socio-ecological information to regional and community organizations for assessing development. From Dene Kedǝ to Dene Ts’ı̨lı̨ is a collaborative project that explores lessons learned through the past fifty years of Dene and Métis language and way of life initiatives. Bringing together knowledge and experience from longtime activists and educators and youth, as well as review of over 275 documents, the aim is to create a resource for decision-makers and researchers as a basis for resurgence in the Sahtú Region. All phases of this project involve a dialogue between today’s initiatives and yesterday’s legacy. 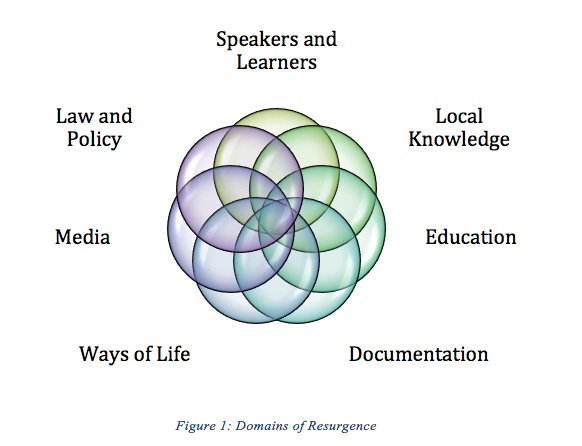 The picture that has emerged is complex, involving at least seven domains of resurgence: speakers and learners; local knowledge; documentation; education; media; law and policy; and ways of life. During this project we saw the emergence of exciting projects like the Dene Ts’ı̨lı̨ School, a cross-cultural on the land learning opportunity for youth. This school became an integral part of the research and learning process. Explore the resources that contributed to this research using the Dene Kedǝ to Dene Ts'ı̨lı̨ Catalogue of Resources. 1. Sahtú Dene and Métis families need to live, learn and be well on the land. 2. Holistic Dene Kedǝ and Dene Ts'ı̨lı̨ programs support strong governance. 3. 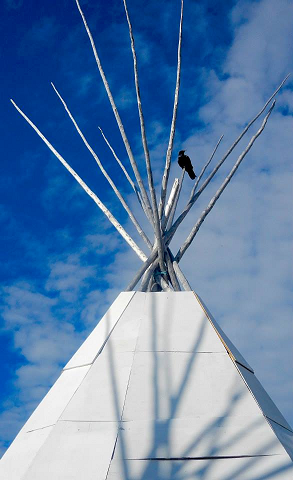 Youth need to be drivers for Dene Kedǝ and Dene Ts'ı̨lı̨ initiatives. The research team began with a SSHRC-funded research project, resulting in an October 2017 report. This report synthesized existing knowledge about Dene Kedǝ, (Dene language) and Dene Ts’ı̨lı̨ (being Dene, Dene ways of life) in the Sahtú Region. Its focus, was to review revitalization programming from the last 50 years of Sahtú history, in order to understand what work was already done, what impact it has had, and what lessons have been learned from it. Key report sections included a literature review; a synthesis of Dene and Métis youth interviews; a timeline; an annotated bibliography; key messages for policy; and a plan for knowledge mobilization. The research team recognizes that there remain gaps in the compilation, and plans to continue adding to the compilation during Phase 2. The research team has begun building results into a searchable database, sharing results on social media, and adding new resources to accessible platforms as they are surveyed. Future goals include the development of an interactive online timeline. This review of historical programming also continues to inform contemporary projects with youth such as the Dene Ts’ı̨lı̨ School, which many of the Dene Kede to Dene Ts’ı̨lı̨ report co-authors are involved with. A further output of this project has been the development of a new network of knowledgeable individuals, both currently active and retired, as well as Territorial and regional organisations with an interest in supporting Dene Kedǝ and Dene Ts'ı̨lı̨ processes. As Sahtú-based co-authors directly apply research results in regional and community initiatives (such as the SRRB, Nę K’ǝ Dene Ts'ı̨lı̨ Forum, Sahtú Youth Network, and local Ɂehdzo Got'ı̨nę), the regional network will disseminate knowledge with an eye to best practices in policy and scholarship. This research was supported by the Social Sciences and Humanities Research Council of Canada: An Indigenous Knowledge Synthesis Project as part of the Imagining Canada’s Future Initiative. The team also thanks the Ɂehdzo Got'ı̨nę Gots'ę́ Nákedı and University of Toronto for their partnership. This report provides an overview of the implications of this Knowledge Synthesis, followed by a discussion of project scope and approach. Results are provided in two sections: first a thematic timeline summarizing the literature review, and second a summary of key messages from the activities, focus groups and interviews at Dene Ts'ı̨lı̨ School. More details are provided in a series of appendices. pdf Appendix A (189 KB) : a list of acronyms and terms used in the report, along with a map of Sahtú communities. pdf Appendix B (424 KB) : experiential reflections by the four Dene/Métis co-authors. pdf Appendix C (1.86 MB) : an in-depth discussion of “Youth Knowledge” from Dene Ts'ı̨lı̨ School and the questionnaire used for interviews. pdf Appendix E (439 KB) : a detailed timeline of events. pdf Appendix F (601 KB) : a bibliography of 177 annotated sources. How do Dene language speakers of the Sahtú Region understand and participate in processes related to the NWT Species At Risk (NWT) Act? 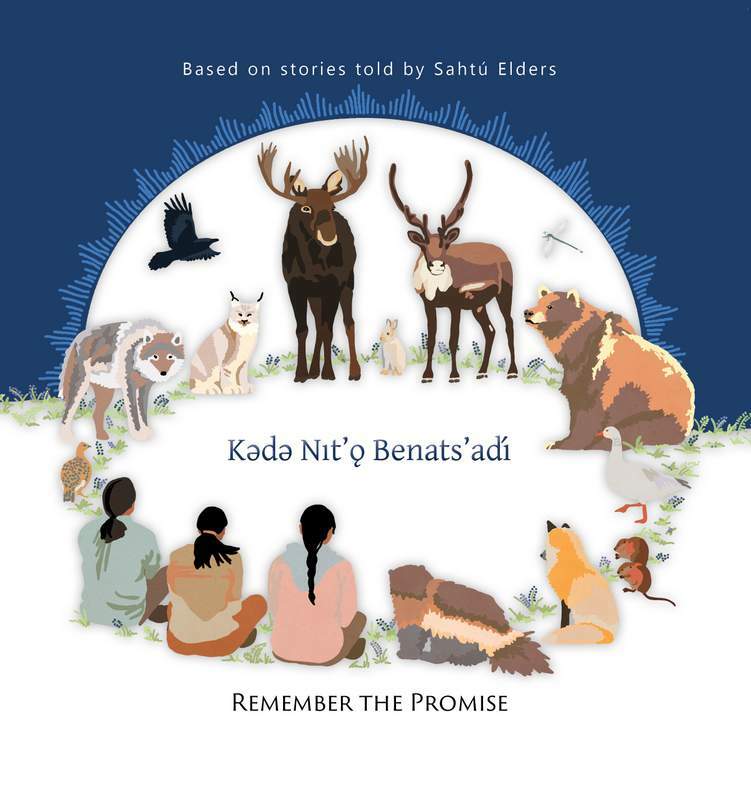 Five years after establishment of the Act, the Ɂehdzo Got’ı̨nę Gotsę́ Nákedı (Sahtú Renewable Resources Board) has published a new book, Remember the Promise,based on stories told by Sahtú elders and with a foreword by Michael Neyelle. The catalyst for the book was a 2013 workshop in Délı̨nę with elders and Dene language specialists from Fort Good Hope, Tulı́t'a and Délı̨nę. Facilitator and linguist Betty Harnum along with staff from the Government of the Northwest Territories (GNWT) Department of Environment and Natural Resources (ENR), Species at Risk office, explained the Species at Risk (NWT) Actas a starting point for recording stories and terms reflecting Dene perspectives and knowledge. Recognizing that Dene is mainly an oral language and few are comfortable reading it, the book is an effort to make Dene language literacy more accessible by mixing Dene terms into an English language narrative. Illustrations by artist Jean Polfus help to bring the story alive. To help people learn to pronounce the terms, Ɂehdzo Got’ı̨nę Gotsę́ Nákedı plans to publish online audio versions of the book in the near future. In addition, a learning module for schools based on the book is being developed in partnership with ENR and Ecology North. It was not possible to include all the rich variations in the language within communities, but two versions of the book include terms from the two major dialects of the Sahtú: Tulı́t’a/Délı̨nę and K’ásho Got'ı̨nę. 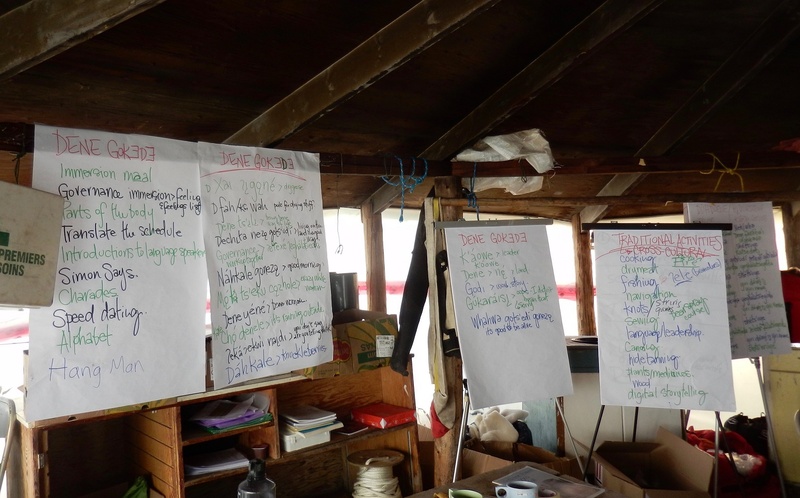 Dene language terms were translated into English, and the group learned that the concepts in Dene language and English are not exactly the same, since they come from different cultures and worldviews. The Remember the Promisestory starts with ancient times when wildlife were giants and made their own laws, and describes how Dene and other living things agreed to live together and take care of each other. The book includes a glossary and terminology list, as well as information about the Species At Risk (NWT) Act, which is different from Canada’s Species at Risk Act. The 2013 workshop was sponsored in partnership with the NWT Species At Risk Secretariat. Book publication was funded by NWT Education, Culture and Employment. Buffalo Air provided in-kind support in transporting the books to Sahtú communities. Book launches are being held in each of the Sahtú communities, and books have been distributed to community members, schools and colleges free of charge. The book is available free of charge on here. pdf Click here to download the Tulı́t’a/Délı̨nę (7.17 MB) version and pdf here to download the K’ásho Got'ı̨nę version (20.28 MB) . It can also be purchased through the Book Cellar’s online store (http://bookmanager.com/168003x/) or at their Yellowknife outlet, or at the Norman Wells Historical Centre. You can also view the book online in English. © Sahtú Renewable Resources Board.